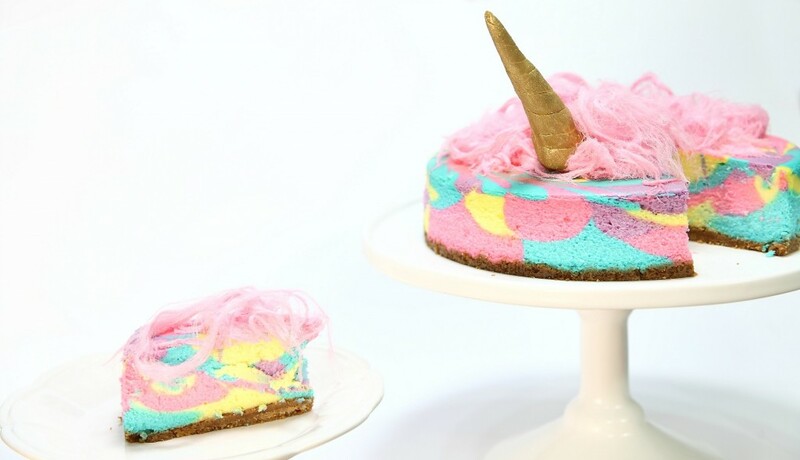 The coolest cheesecake on the block! We love unicorns. And rainbow, and well, pretty stuff. It’s a girly kinda house we live in, where the brighter and crazier the food, the better. Wrap a 9" springform pan with foil, making sure it's high enough that water can't get in. Crush the biscuits (cookies) by hand or a food processor and then mix in butter with your clean fingers, or again in the food processor. Press the mixture into the pan. Bake the crust for 10 minutes on a low oven rack. Allow to cool completely. Turn oven temperature down to 325°F (165°C). For the filling, whip cream cheese in a mixer using the whisk attachment, or with a hand held mixer on medium speed. Whip until smooth, about 3- 4 minutes. Then add sugar, and continue to beat until smooth, another 3- 4 minutes. Add vanilla, salt, sour cream and heavy cream and beat on medium until smooth. Add in 1 egg at a time, beating between each egg. Divide into 4 bowls. Add food color to each bowl. 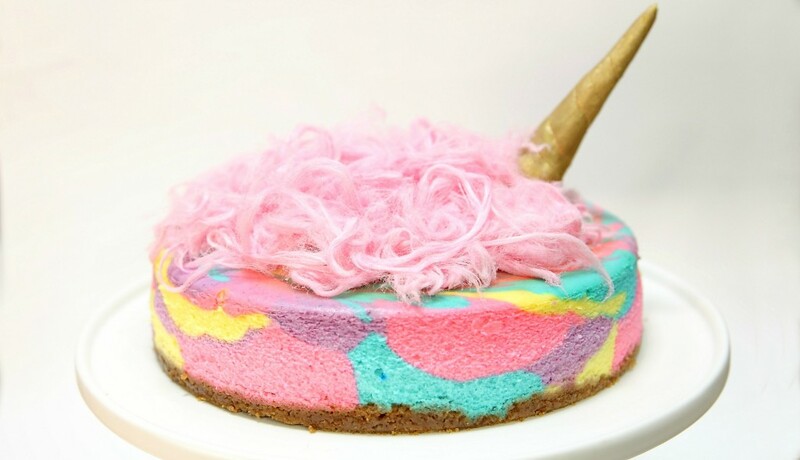 Using dessert spoons, dollop the colors into the pan. Create a water bath for the cheesecake by placing the pan into a roasting dish, and filling with boiling water about 1 inch up the side of the springform pan. Bake for 1 hour and 30 minutes or until set but still jiggles slightly 2 inches from the edge. Cover the cheesecake in cling wrap, not touching the surface, and refrigerate for 4 hours or overnight. Remove the cling wrap, open the springform pan, and remove the side. Store cheesecake in the fridge, and it can keep for 3 days.